I commend to you Phoebe our sister, who is a servant of the church in Cenchrea, that you may receive her in the Lord in a manner worthy of the saints, and assist her in whatever business she has need of you; for indeed she has been a helper of many and of myself also. There are only two verses in the Holy Bible which address Phoebe. Her name appears only once in the Holy Bible. Phoebe’s name is held in esteem by St. Paul himself in both verses, and in both verses she is described as a helper. Phoebe’s name is further honored as it precedes the greetings to the people of Rome many of whom are found in the traditional list of the seventy-two apostles. Within these two distinct verses we have no description of what Phoebe was like. We do not know how old she was. We do not know if Phoebe was single, married, widowed, or a mother. We have no idea if she was poor or wealthy. Apparently St. Paul did not think any of these things important in identifying her to other Christians. What St. Paul probably did consider most important is the fact that she was a helper to him and many others in the service of the Lord Jesus Christ, and the early church. St. Paul addressed her as “our sister” and “a deaconess”. The first thing we can surmise regarding Phoebe and the early church is that she must have truly loved the Lord to have been mentioned in such a way in the Holy Bible; categorized by St. Paul as his “helper”. We know that Phoebe’s love for the Lord extended beyond church attendance to develop into a commitment to mission service. Perhaps Phoebe, being significant enough to be mentioned in two verses complimenting her helpfulness, did assist St. Paul in his missions. Many Biblical scholars believed that Phoebe was delivering a letter from St. Paul to the Romans. It can be held certain without a doubt that Phoebe’s depth of commitment to the service of the Lord Jesus Christ, and her willingness to use her gifts and talents to serve the Lord was first among her characteristics. If Phoebe carried St. Paul’s letter to the Romans then we can be quite sure St. Paul had complete confidence in her. For Phoebe to have had recognized and distinctive church service, she must have been dependable. Dependable has many meanings. Among the meaning of dependable is that a person is reliable, on time, regularly attends to one’s gifts and talents, and is considered always ready to further one’s service. 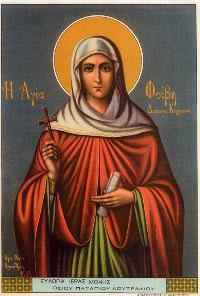 Phoebe, in her service to the early church, was dedicated, trustworthy, and dependable. This is how St. Paul described someone he had selected and entrusted with the carrying of his letter to the Romans. This is what St. Paul must have considered the greatest among traits required of those who serve the Lord Jesus Christ and the church. Phoebe was important to St. Paul not because she was outspoken, beautiful, well learned, rich, or family connected, but because she was a helper to many and to him.